Dale Obrochta, providing outstanding service every day, one library at a time. Engaging families that attend the library: Put a Twist of Fun into your reading program. With every twist of the wrist, a swirl of a balloon and funny pun uttered, Dale, captivates an audience like a Pied Piper playing a tune. The audience is swept away by the balloon twisting choreography, the audience relaxes and enjoys the moment. Tranquility sets in; knowing that behind every twist and joke is a veteran entertainer ensuring that the unexpected pop will not deflate the fun. How this show draws more families to the library than other shows. A never-fail opening or closing show that works for any library theme. A show that is designed for 5 to 75-year olds. The comedy, choreography, and interactivity of the Magic Balloon-dude’s library show send kids into creativity fun overdrive – which, after all, is a mission of the library. 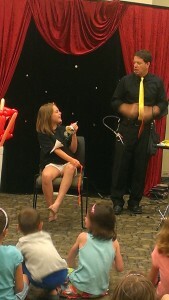 The library silence is broken with children laughing as they sit, watching Dale’s co-star’s reaction as Dale inflates a balloon through their head. Making for a priceless moment. Parents appreciate going to the library and interacting with creative people like Dale. The library and Dale create an experience that makes going to the library fun and educational. “I just wanted to say thank you again for a FABULOUS program! Everyone is still raving about you, and all are still enjoying the balloons you left for us! – Wendy Asbridge Mokena Public Library. • Kids and parents become stars of the show. 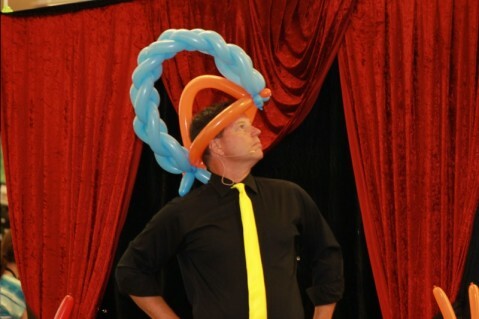 • Choreographed balloon routines to upbeat music. • Professional PA Sound System to ensure a full audience experience. • Stunning blacklight presentation that wow’s an audience. 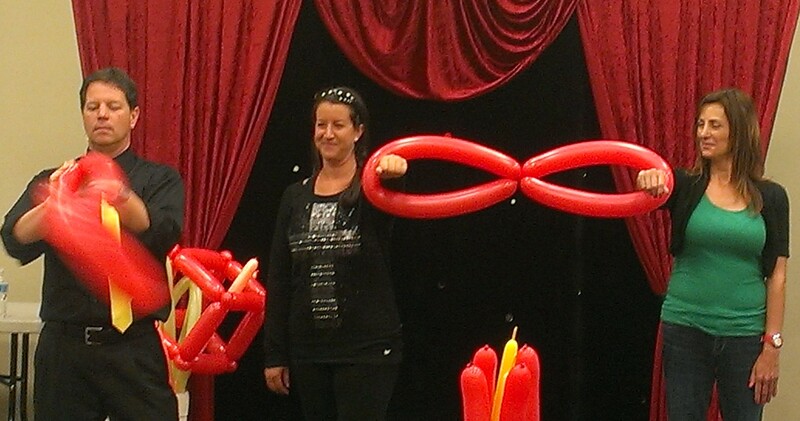 • Colorful 5′ foot balloon sculptures created on stage. • Theatrical backdrop setting to enhance the audience viewing experience. • A write-up to use for promoting the show. • Photo Opportunity After the Show where the audience is encouraged to take pictures with large sculptures and to share on social media. • School keeps large balloon sculptures to decorate the school. The Art of Inflation interjects fun into an event, and its flexibility allows librarians to use this show for special events that require a great family-friendly show that gets an audience laughing as one. Let us make your patrons the star of the show! – parents are involved too! Turn the house lights off and hear the oohs and aahs from the audience as glowing balloons twirl about the room. Blacklight works in most environments. It only requires the lowering of lights, but the darker you can make it, the more dramatic the effect on the audience. This is a completely self-contained, all ages show. Sound system, backdrop, table, balloons, etc. are included. All you need to do is provide the audience. The program is 45-minutes long and is complete. There are no extra fees for travel, etc. I encourage you to send out a message on your listserv to coordinate with other libraries. Because you are networking and creating a joint event, you will get the fees reduced. If you schedule two or more performances the fee drops. The programs do not have to be at the same location, merely coordinated with another library on the same day. B++ Over All Rating: We actively survey librarian and ask them to rate the show Art of Inflation and it’s booking process. We then assign a letter grade to the responses. Questions on cost, marketing materials, booking process, youth services needs, and program quality are ranked. The results tabulated give Art of Inflation an overall rating of B++. – Natalie Djordj, Green Hills Library. – Mary Bannon, Lisle Public Library. – Carol Daumev Gufjhr, Lake County Public Library, Merrillville, IN. -Lorie Rohrer, Lake Forest Library – Booked 3 consecutive years! With Dale performing hundreds of shows each year and with the limited amount of dates available in the library program, it is important that you reserve your date ASAP. Email or call (708) 744-0234 to secure a date. There is no obligation to hold the date, just call and place a “hold” on the date until you can confirm it. Fill in the form and Dale will call you; it’s that simple! LibraryBalloonShow.com is where librarians can find a professional, family-friendly and unique show that generates foot traffic and books being checked out. Our goal is to provide the highest quality entertainment to libraries resulting in a great library experience.